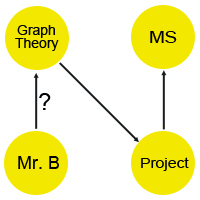 Graph theory is the only subject that holds me from completing my MS degree. Yesterday, I wrote this exam for the third time and I don’t think there is any chance to pass. I have a very low internal (19/50), so I need 62 marks in external to clear this exam. In all my life time, I have not scored 60% in mathematics. If I do not know an answer, I would create a new concept on my own 🙂 but that does not work with Graph theory. The questions were not that complicated, but I was very disturbed with one particular question. One of the guys have to marry one more cousin, but that is against moral. I’m single, so I can marry the fourth girl, but I’m not her cousin. The university is merciless to the fourth girl. At least will they show some kindness on my paper evaluation? School drove me crazy too :). Sounds complicated to me. Good luck.